Margaret Bradford is a teacher, singer and songwriter who is well known in the local and international folk music scene. Today she was our guest on the Hobo Gro Radio Show on Radio Skid Row (88.9 F.M.). 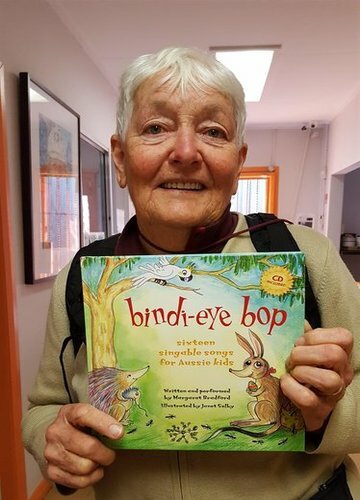 Margaret talked to Bob and Carla about her career in folk music and played music from her children’s picture book and CD “Bindi-Eye Bop”. The central theme of “Bindi-Eye Bop” is being green and saving the planet, saving water and the oceans and avoiding plastic as much as possible. We also played “Say No To Plastic” from her other CD “Margaret Bradford – 10 Years On”. We had a lovely time with Margaret and look forward to hearing more music from her.